¡Hola de Las Pirámedes en Guatemala! (That means “Hello from the Pyramids in Guatemala!”) How are you doing? I hear it’s snowing, I’m sure it’s beautiful there. I miss you! When I call you from here in Guatemala our conversation is more like, “Soooo…………….are you okay?” “I’m great. It’s beautiful here.” “Welllll…. (sigh)……alright…..love you,” and you sort of sound like you might never see me again. Maybe I can explain better in letter form. After an overview I’ll describe what a typical day looks like for me and maybe you’ll understand better what I’m up to. The name of the retreat center where I’m staying is Las Pirámedes del Ka. (Quick Mom tip: If you right-click on that link you can choose to open it in a new tab so you can keep reading this and then you can look at that later.) The Pyramids of the Spirit. 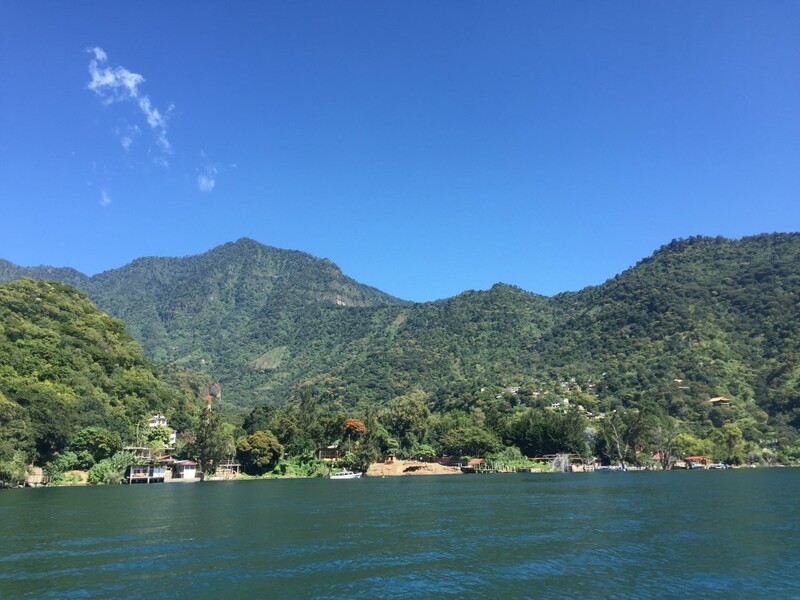 It’s a meditation center located on Lago de Atitlán, a lake large enough that you can take a half hour boat trip to go from one town to another. The lake is in a large volcanic crater, over 1000 feet deep in parts, which is itself surrounded by three volcanos. If you’ve caught any of my photos on Facebook then you’ve seen Volcano San Pedro (which I’m hiking on Sunday; if anything happens to me, I’ll make sure someone will let you know). There are a handful of villages around the lake; the one we’re in is San Marcos la Laguna. We range in age from 21 to 43 (one other 43 year old besides me, in case you’re wondering) and we come from Australia, Canada, Columbia, Sweden, the UK, and the US. Some travelled here just for the course; the majority are incorporating the Pyramids into a longer (or much longer) period of travel. Sort of like at the Kitchen, there’s no one in the group that I don’t like – everyone is pretty awesome in their own way. Why are the pyramids here? Chaty, the woman who founded Las Pirámedes, came here from Guatemala City almost 30 years ago. She had a vision that she was supposed to open a spiritual center and she chose this location because of its three natural “pyramids” – the volcanos around the lake. Chaty is in her 60s (I think), physically slight, spry, and incredibly wry. She’s hilarious and she knows it. I’ve yet to see her wear anything but all white. The grounds of the center is made up by three main areas which contain student residences, a garden, and a pyramid shaped temple. There are also a few houses for the half dozen people who make Las Pirámedes the amazing place that it is – Chaty’s two grown daughters, Pauly and Luly, and a few others. Chaty has mentioned that San Marcos has grown with the pyramids. It seems that she was one of the first to feel the healing energy here and that in the 25 years since Las Pirámedes has opened, word has spread. Now that you have an overview of where I am, let’s take a look at what I’m up to all day. Try this meditation exercise. Here’s a timer (you don’t have to right-click, just click on it). Set it for 30 seconds, press start, and close your eyes and focus on your breath the whole time. You don’t have to breathe any special way, just think about your breathing and don’t think about anything else for 30 seconds. The timer will make a sound when it’s done. Yes, really. Actually do it: close your eyes for 30 seconds right now and don’t think of anything. What do you think? Not that easy to think of nothing, right? I realized as I was writing this that you may not know why I meditate, or, for that matter, what meditation is. Now that I think about it, I’m not sure I know what it is but I’ll take a stab at it. As I see it, without looking it up online, meditation is the practice of helping the mind get still. It’s called a “practice” because our minds don’t like to stop thinking, therefore we have to practice. My experience, and my impression from most people, even experienced ones, is that the majority of meditation is thinking thinking thinking (or as Chaty would say, takata-takata-takata). We meditate as a group twice a day and Chaty recommended that we do a third session on our own. Back in Boulder, with a job, I barely managed 20 minutes a day. Since I’m privy to this insane luxury of time, I do this third session first thing in the morning, at 6am alone in my little cabin which I don’t share with anyone. So that’s what meditation is to me. Next question you may not have and which I’ll answer anyway: why bother meditating? The ideal reason is that through this practice we – I – can come closer to the being or spirit that’s responsible for all this. God, Ka, Higher Power – whatever you want to call it. By getting closer to God maybe I can have more compassion for people who suffer. Great question, but I’m getting ahead of myself; it’s only 6:30am. When I dabble in yoga at home it’s sporadic, with different styles and different teachers. Here at the Pyramids, we practice together every morning, we have a different focus each week and the three instructors are all on the same page. Although I haven’t been able to go yet, this is why I love the idea of my friend Jenna’s “Retreat at Home,” a six day program she leads once a month in Boulder. It’s the same group every day – a community is formed, Jenna knows is familiar with each student’s ability, and consequently, their practices deepen. I love the way the temple is constructed. We take off our shoes, and then to enter we go down six or seven stairs, then there’s a passageway where we stash anything that doesn’r relate directly to what we’re doing, including water bottles, extra clothes and bags – the temple space is very minimal and nothing extraneous is brought inside – and then we go up six or seven stairs, entering the temple through its floor. When everyone’s inside trap doors are folded over the opening and the resultant space is clean, wooden, and has no clunky, energy-sucking doors. White mats with very short meditation stools are placed around the perimeter; as each person enters she or he finds a mat and sits cross-legged on the stool. The class is led most often by Chaty’s daughter Luly, or either Jenika or Thomas, two spiritual beings who have lived and worked at the center for six and eight years. For an hour to an hour and a half we stretch and breathe – or, more accurately, we breathe and stretch. The idea is that breath comes first, all else follows. Our 24 person group is pretty evenly mixed women and men with most of the men being novices. I wish I could videotape a class for you, in one yoga position we’re sitting on the floor with our legs forward and we’re instructed to stretch to our toes. The men (maybe it’s just me) don’t look like we’re doing anything except stretching our arms forward, like a lazy child playing superman, while the women are doubled over flat, their arms extending way past their feet. Here we are again: why yoga? And again, there are practical and ideal reasons. And when we leave we all seem to feel pretty great, and it’s only 8 or 8:30. Ready for the day. Shambala Cafe. That’s Jess and Alex on the right. At this point I usually cruise out of yoga and get coffee at either Moon Fish or Shambala, two sweet little cafes. San Marcos has great coffee, and though neither is by any stretch of the imagination like Boxcar (that place we went for pastries once), they grind and brew to order and the beans are grown and roasted a couple miles away. I catch up on Blank Plate stuff, cruise around the internet, and write long letters to my mom because I miss her so much. At 10:30 we’re back to the temple. First we meditate as a group for a half hour, then we have metaphysics class. Metaphysics is roughly translated as “the science of that which is beyond the physical.” A simple example would be let’s say you catch a cold. Is it possible that you caught the cold because you were stressed about work the past few weeks? A mental condition was responsible for the physical ailment. Have you ever had a dream and while you were dreaming you realized that you were dreaming? For me it happens sometimes when I’m flying in my dream – I realize that I’m flying, and flying is such an unusual occurrence that my mind realizes that I’m in a dream. At that point I might stay in my dream for another second or two or five or 30, and then I’ll wake up. But during that part that I realize I’m dreaming I can sometimes control my flying. So that part where I’m in the dream and aware that I’m dreaming and controlling my dream – that’s lucid dreaming. We cannot intentionally lucid dream but we can create situations and train ourselves so that while we’re dreaming we’ll be more likely to realize that we’re in a dream and then we’ll wake up within the dream. When that happens we might have the presence of mind within the dream, even though we’re dreaming to investigate different aspects of life, to gain insights that we can’t necessarily gain when we’re awake. And also, it’s sort of fun when I’m awake in my dreams. Lucid dreaming hasn’t happened to me since I’ve been here, although my dreams have been noticeably more vivid, which is fun in it’s own way. Astral traveling is sort of like lucid dreaming, except that when we astral travel we’re awake. We’re in a meditation state and then we realize that we’re leaving our bodies and, as with lucid dreaming, we have a chance to investigate aspects of life that we can’t access when we’re awake. And as with lucid dreaming, I haven’t experienced astral travel, although some of my classmates have. Umm…does this stuff really happen? I imagine you’re a little skeptical. I was definitely skeptical of these types of things before I got here; though I don’t (yet?) have any personal experience with them, I’m now a believer, probably because Chaty talks about them with utter matter-of-factness. It’s not even conviction; to her, it’s just something that happens. You can train for it, like running a marathon, except that you can’t choose to lucid dream or astral travel, you can just prepare yourself for the possibility. You’re most likely still skeptical and I don’t blame you. Two more non-argumentative points about the topic. First is that in this amazing interview with Deepak Chopra, a guy who has written many New York Times bestsellers, he talks a lot about astral traveling, and, like Chaty, he is totally matter-of-fact about it. It’s just something that happens. He’s not trying to convince anyone, even though the interviewer is surprised and doesn’t seem to believe him, at least not right away. Lastly, a question: Do you believe in anything that you can’t explain or that you don’t have personal experience with? If so, isn’t it possible that there are other wacky things out there that we can’t explain? I’ll hold off here and finish up in the next couple days. I love you!